Please Note: For admission through security, members must register at the website at least 48 hours before an event. If you are not already a member, please join to register. Thank you. 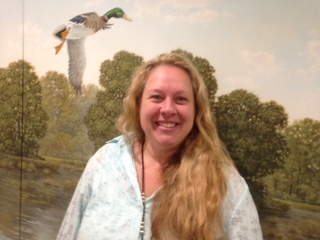 Suzanne Fellows will speak to us about her role with The Federal Duck Stamp Program for the U.S. Fish and Wildlife Service (FWS). Migratory Bird Hunting and Conservation Stamps (Duck Stamps) are one of several extremely successful conservation tools available to help conserve our wildlife resources. Funds from the sale of the stamp are used to purchase wetland habitat for the National Wildlife Refuge System. Duck Stamps are mandatory for waterfowl hunters over the age of 16 but stamps can be purchased by anyone interested in making a contribution to conservation. Sales of Duck Stamps have led to the dedication of over 8 million acres to wildlife conservation in the program’s 80+ year history. The Junior Duck Stamp Program offers students in K-12th grade the opportunity to explore wildlife and habitat conservation through the arts. A recently revised curriculum encourages students, teachers, families and communities to investigate, express and share their observations of wetlands and waterfowl. Sale of Junior Duck Stamps provides funding for the program which reaches over 200,000 students, educators, families and communities each year. Suzanne Fellows holds a BS degree in wildlife ecology from University of North Dakota and MS in wildlife management from Utah State University. She began her USFWS career in Refuges in Colorado and Kansas prior to joining the Migratory Bird Program in Denver, Colorado in 2000. In 2013 she joined the Duck Stamp Office at USFWS Headquarters. She has been involved in the Junior Duck Stamp Program since 1996 and currently serves as the national coordinator for the program.